According Flagscan 63 the provincial flag of Pisa is yellow with eagle. In my files was a quotation about an white flag or gonfalone with arms. Anyone have more information? 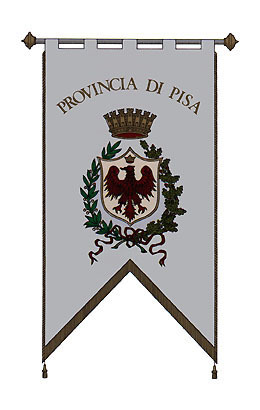 The provincial CoA of Pisa is silver with red eagle under yellow crown. See http://www.provincia.pisa.it/.